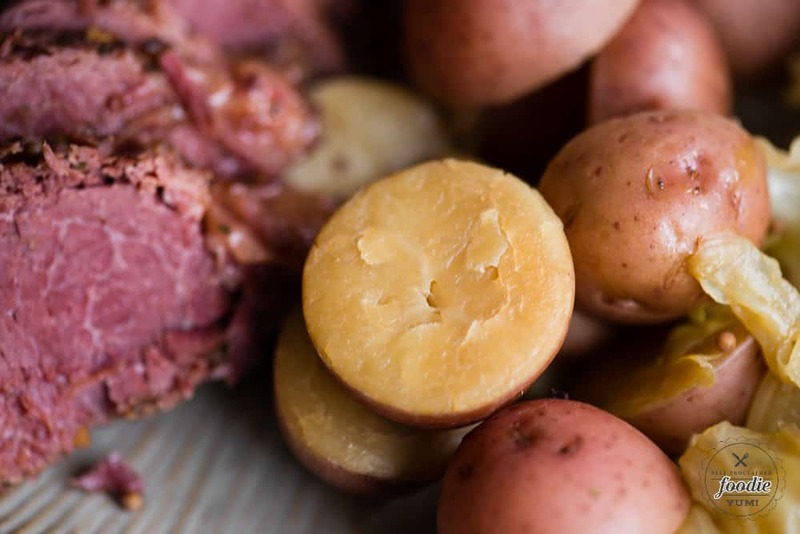 Pressure Cooker Corned Beef and Cabbage with creamy baby red potatoes and carrots is a flavorful easy meal with the most tender meat! A marinated corned beef brisket is cooked in the instant pot with beef broth and Guiness stout and completely falls apart when done. This complete meal is great for St. Patrick’s Day! Pressure Cooker Corned Beef and Cabbage is quick and easy in the Instant Pot! If you’ve ever made corned beef and cabbage, you probably used your slow cooker. 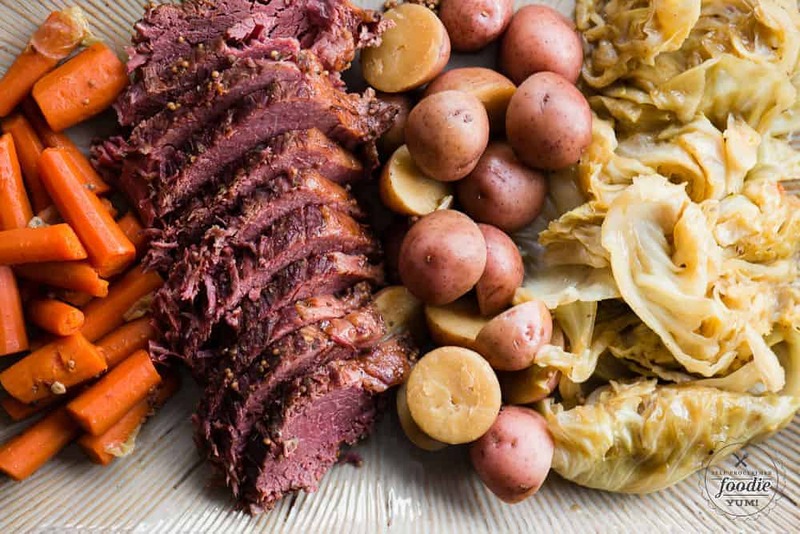 I will guarantee that this Instant Pot corned beef and cabbage is a million times better than any crock pot corned beef recipe you’ve ever tried. Why? Well, first of all I’ll take quick over slow when it comes to recipes any day. Second, the Instant Pot infuses the liquid into the meat. This not only enhances the flavor, but makes your corned beef so incredibly tender that it falls apart when you cut it. You just can’t achieve the same results in a crockpot. 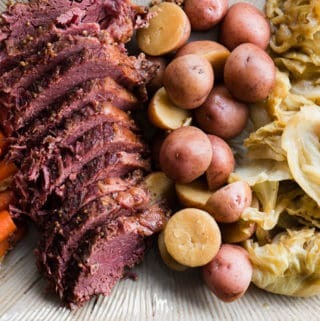 I love this meal because it comes complete with your meat (corned beef brisket, carbs (baby red potatoes), and veggies (green cabbage and carrots). Nothing else is needed except for maybe a good wine pairing or dark beer. Speaking of beer… did you know I love to cook with Guinness? I won’t drink the stuff, but it is fantastic in recipes! Did I make my corned beef with Guinness? Of course! Here are some other great ideas! Bangers & Mash with Stout Onion Gravy – Not only is this a popular recipe of mine on St. Patrick’s Day, but I’m always surprised at how many pageviews it gets year round. I guess people love their sausage and mashed potatoes for dinner. What is corned beef and cabbage? Corned beef got it’s name because it is salt-cured with large grains of salt called “corns”. Because the cut of beef used is often tough with little fat, it must be braised. This means it must be cooked in liquid for a long period of time in the oven or crockpot, or rather quickly in a pressure cooker. 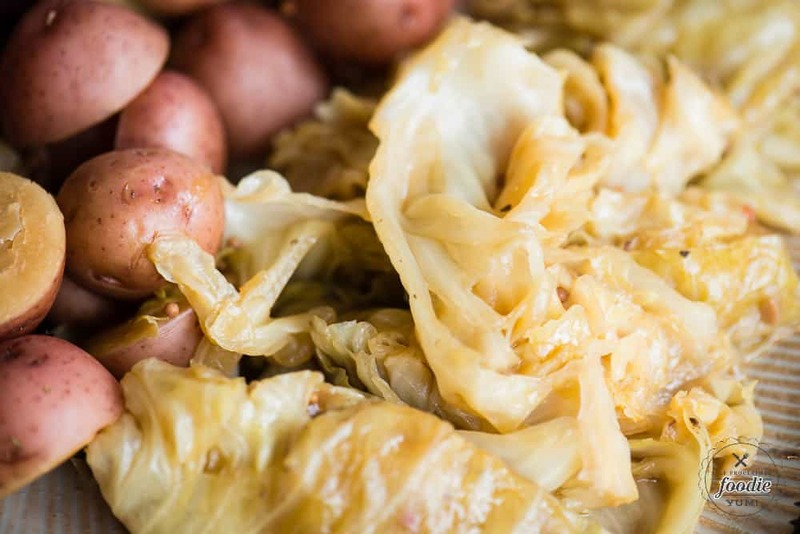 Throwing cabbage in the cooking liquid after the beef is removed is an easy way to serve a green vegetable with the meal and it compliments it well. From what I understand, many cultures have cured beef and heavily salted beef as a means of curing is a very common method. Irish corned beef became extremely popular, however, during the British Industrial Revolution. It was widely consumed during that time to feed British and North American armies. Although corned beef is not really considered a national Irish dish, it is often associated with Saint Patrick’s Day in the United States. This came about from Irish-Americans in the late 19th century and is similar, yet much more flavorful than, a New England boiled dinner. What corned beef is best? Most corned beef you’ll find at the store contains nitrates or nitrites to preserve it. Any kind of cured meat, like bacon or lunch meat, needs preservatives to keep it from spoiling. I take extra care to avoid buying any meat that contains nitrates or nitrites. Instead, I look for meat that does not add them. They still get preserved, but it’s through nitrates or nitrites that naturally occur through the curing process, most often times through ingredients like celery salt. I passed over so many packages of corned beef because they contained nitrates or nitrites. I finally found one that didn’t have added nitrates or nitrites and, of course, it was at my favorite grocery store – Trader Joe’s. The specific cut of meat in the package was an uncured corned beef round flat roast. It already came marinated in spices which made cooking in the Instant Pot about as easy as it gets! What’s in a corned beef spice packet? If you’re buying a corned beef to make, chances are it will come marinated or with a spice packet. A lot of recipes will tell you to put the corned beef and the spice packet in the crockpot or Instant Pot. You might be wondering what on earth is in that spice packet. Most often, you’ll find that a corned beef spice packet consists of mustard seed, coriander seed, bay leaf, and hot pepper. Sometimes you’ll also see allspice berries, dill seed, or even cloves. 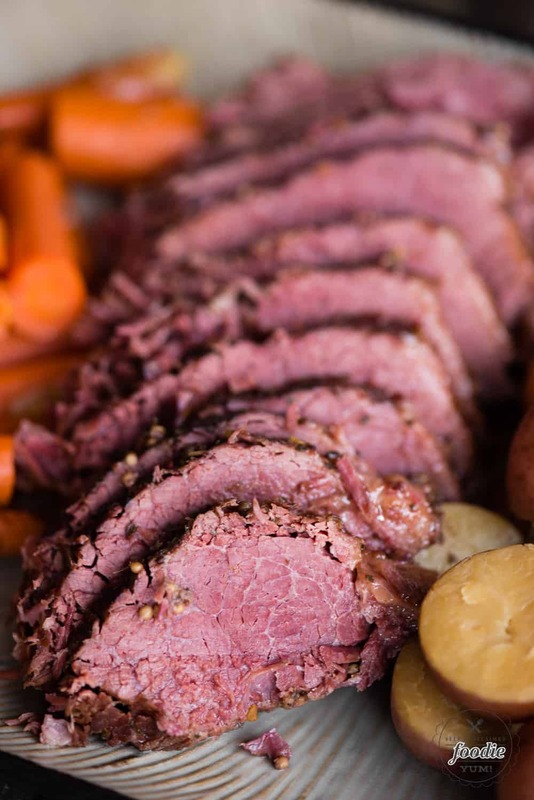 The flavor of corned beef spices is indeed unique, and when cooked in the pressure cooker, really gets infused into the meat and vegetables. You’ll add the corned beef and spices or marinade to the cooking pot of your Instant Pot, or whichever brand you use. To the meat, you’ll add a quartered onion, beef broth, stout beer, and bay leaves. I cooked my meat for 90 minutes on high pressure and it was amazing. Perfectly tender and not at all dry. When the beef is done cooking, you’ll allow it to naturally release pressure for about 10 minutes and then you’ll quick release the remaining steam. Set the meat on a plate and loosely tent it to keep it warm. Next you’ll cook the veggies. You can do this all at once, but I prefer to throw the potatoes in first. If you cook the potatoes for the same amount of time as the cabbage and carrots, you’ll end up with not-so-good results. You’ll either get firm potatoes and perfectly cooked carrots and cabbage. Or, even worse, you’ll have perfectly cooked creamy potatoes and mush for cabbage and carrots. Once everything is done, serve it all up on a platter and you can add extra cooking liquid if you wish. No extra salt needed! I chose to add stout to my cooking liquid because it not only adds flavor, but it helps make the meat even more tender. The darker the beer, the more intense the flavor. If you don’t like Guinness, don’t worry. You can’t really taste it in the finished meal. Not at all, actually. It’s hard to explain, but it will add amazing flavor that will please anyone, even if you hate beer. If you’re using a pressure cooker, 90 minutes is a good rule of thumb for just about any kind of large cut of meat. You can tell when it’s done cooking because it should be fork tender. If you’re boiling (heaven forbid) your corned beef, a good rule of thumb is about an hour per pound. Many recipes for cooking a corned beef in a slow cooker indicate you will cook it on 4-5 hours on high or 8-9 hours on low. I suppose the low setting is great if you want to make it in the morning before work and come home to dinner. But I will argue til the day that I die that using the pressure cooker is always better than the crockpot! Pressure Cooker Corned Beef and Cabbage with creamy baby red potatoes and carrots is a flavorful easy meal with the most tender meat! A marinated corned beef brisket is cooked in the instant pot with beef broth and Guiness stout and completely falls apart when done. This complete meal is great for St. Patrick's Day! • Put the beef, beef broth, stout, onion, garlic, and bay leaves in to the pressure cooking pot. Lock the lid in place. Select High Pressure and set the timer for 90 minutes. Once done, allow a natural pressure release for 10 minutes, and then do a quick pressure release to release any remaining pressure. • Remove the roast from the pressure cooking pot and transfer to a plate. Loosely cover the corned beef with aluminum foil until ready to serve. • Scoop all of the solids out of the pot and discard, leaving only the broth. • Add the potatoes to the cooking pot, cover, and cook on high pressure for 3 minutes. Release pressure so you can open the lid, add the carrots and cabbage, and then cook on high pressure for 2 minutes. Do a quick release of the pressure. • To serve, arrange the cabbage, potatoes, and carrots on a platter. Slice the corned beef against the grain and add to the platter. Ladle the cooking liquid into a gravy boat and serve along side meal. The best ever! So flavourful! Hi Barbara, This recipe served about 8. Enjoy! Can I use an old fashioned pressure cooker? You bet! I’m just not sure how the times/process will be different. Can I make two cornbeef briskets in my intapot at same time? Big family. If it’s big enough to fit. I just put mine on (making again) and there’s no way a second roast would fit in mine, but your instant pot might be bigger. What is the difference between Point cut and Flat? I was told years ago to never boil the Brisket and use the Flat, for cooking in oven. Does that still hold true? I will be doubling the veggies, (2 heads cabbage and 2 bags carrots). I cooked potatoes and carrots last night for 3 minutes, and they were mushy when done. Any advice? Should I just cook the veggies in oven instead? Hi Jodi, I’m not sure about your point vs flat cut question. I’ve never seen corned beef offered either way. Did you cook the potatoes and carrots in the liquid after the beef per the recipe? I’m a little confused. Cooking in the oven is always an option, but I like only having to dirty the instant pot and nothing else! Would you have the meat raised on rack in instant pot or in the liquid, like a boil? I don’t use the rack for this recipe. I just let it cook in the liquid (I’m making it again right now!). This is an awesome recipe! 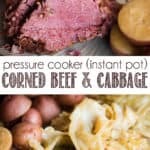 It literally saved my holiday because I needed to feed 100 people- I bought 3 more instant pots and the corned beef came out flavorful and so tender without any worries- BEST way to prepare corned beef- thank you! If two corned beefs fit, do you need to increase time? I usually go with recommended time, even if doubling the meat, and then checking the internal temp when done. If it’s too low, I’ll close the lid and add time. Excellent recipe! This is the first time I’ve actually made a corned beef that tastes good! I’ve been screwing it up for years. It was also the first time I’ve used an instant pot for this dish. The meat came out moist, flavorful and perfectly cooked. The veggies cane out perfectly cooked and not a mushy mess like I usually end up with! I did find that my family likes twice as many potatoes, so I ended up making another pound of them while we were eating. Question: next time, how will it affect the cooking time if I double the potatoes? Still 3 mins? We had lots of the veggies left overs, but all the meat was eaten up. So I decided to grab a frozen polish kielbasa from the freezer and toss it in the broth. I cooked it for 30mins. It burst open everywhere, so too long, but delicious! We ate it the next day with the left over veggies next time I’ll reduce the cooking time to 20mins, I think. So glad you liked it! I think for next time, you could double the potatoes and try 3 min. There’s enough cooking liquid that the addition of potatoes shouldn’t hurt. When I cook in my IP, I always aim on the lower side with time because it’s easy enough to close the lid and cook longer if needed. Thanks! I made this this using your recipe, and it turned out better than I imagined! !! It is great! Made this for St.Paddy’s Day. SO GOOD. Such a great recipe! The corned beef turned out juicy and delicious! The texture of the meat is perfect and the flavor is fabulous! Another great recipe! Love that I can make this in one pot! So good and so easy! The pressure cooker is definitely the way to go! This one looks good. I even have some Guinness! ·Does it matter if the fat side is up or down? ·I have an 8quart. Is there a rule of thumb for how high the liquid should be on the brisket? I always cook fat side up but don’t know if that matters in a pressure cooker. I don’t think there’s a necessary rule of thumb about how high the liquid is on the meat. Seems like that as long as it’s under pressure and there’s liquid present, that’s all you need. Enjoy!